Pongal is a major Hindu festival that is celebrated in the fourteenth day of January every year. It is a major festival that is celebrated with great religious fervor in the state of Tamil Nadu. For four long days, the celebration of Pongal takes place. Mother Nature is worshiped on this day and people thank nature for bestowing food grain on them.This harvest festival has been named after the Tamil word, meaning “to boil”. On the Pongal day, people harvest the crops that they sow throughout the year. People harvest rice, cereals, sugar-cane and turmeric to mark this festival. People start preparing for the Pongal festival from the mid January in Tamil Nadu. People gather together and celebrate the day with great enjoyment and forget all distances. Several Tamil wedding ceremonies are also arranged on Pongal. Being one of the major Festivals of India, Pongal is celebrated all over India. At different regions, it is known by different names. It is known as Lohri in Punjab, Makar Sankranti in the North Indian states, Hadaga in Maharashtra, Bihu in Assam, Bhogi, Kanumu, Thai Pongal and Poki festival. Grand feasts are arranged on this day and people light bon fire to make this festival a magnificent occasion. On the first day of the Pongal, people celebrate it as the Bhogi festival, which is devoted to Lord Indra. 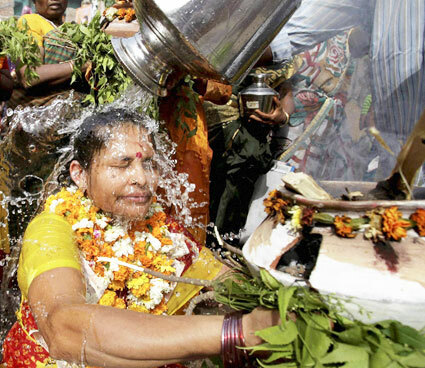 The second day is the Surya Pongla, which is the ceremonial worship involving the boiling of rice in the milk in earthenware. On the third day cows are decorated with tinkling bells, multi colored beads and garlands of sheaves of corn and flower and the occasion is known as the Mattu Pongal. On the final day is celebrated the Kannum festival. On the auspicious occasion of the Pongal, people gift their near and dear ones with interesting souvenirs and gift items. Gift your loved ones with decorative pieces, dry fruit hampers, pooja accessories, Lord Sun sculptures, sweet hampers, fresh flowers, calendar, good luck plants, diary and games items. The Pongal festival is celebrated to invite good harvesting year. Temples are visited on the day of Pongal to seek God’s blessings. Various cultural programs and ceremonies are arranged during Pongal to make the festival a successful one.